One of my goals for 2011 was to do four things in Austin we’d never done before. Success! If you count restaurants, we’ve WAY exceeded four, but even without restaurants, we had a good showing. 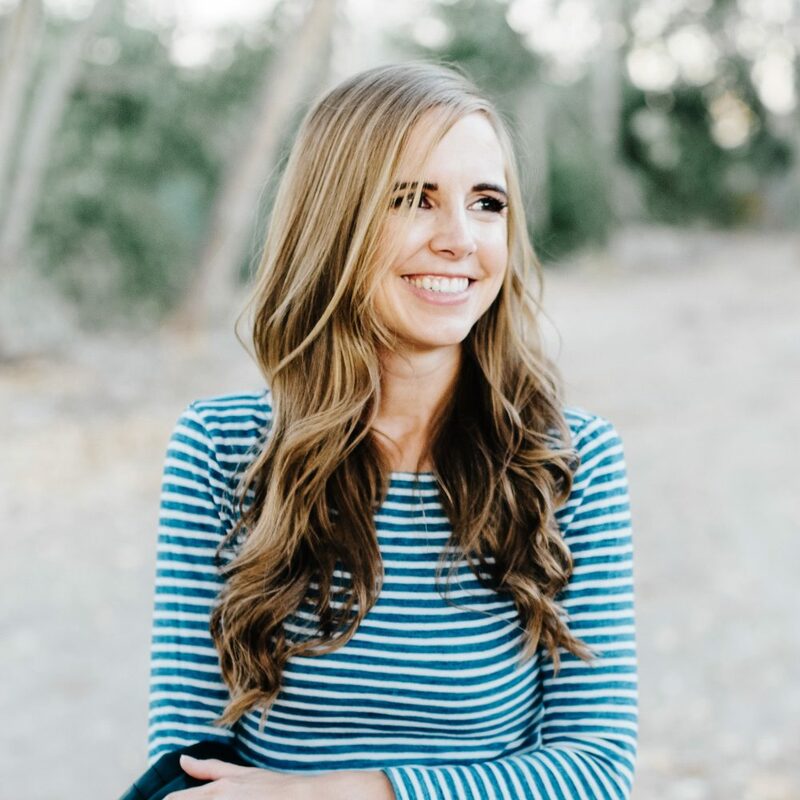 I’ve mentioned, in previous posts, the baseball game we attended, the O. Henry home, Zilker Botanical Gardens, the Zilker Zephyr train, the Gypsy Picnic, all of which were new to us this year. 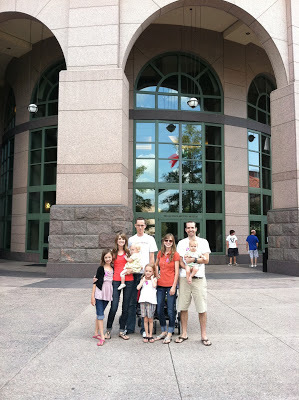 1) The Texas State History Museum. It’s free one day a month, so we headed down there with Ralphie and her family. Amusingly, Ralphie and I were dressed very similarly, and since our hair is the same length and color and the museum was quite dark, everyone had a hard time telling us apart. Her kids kept coming up to hold my hand or hang on to my leg before realizing I was not, in fact, their mother. Bart said he had to pay close attention to be sure he didn’t put his arm around the wrong person. It was a nice outing, with lots of interesting exhibits. I’d definitely go back on another free day. 2) Three theater outings. First, a group outing to see West Side Story when it was performed downtown by Broadway Across America. It as a mega-disappointment. It was so crass we nearly walked out. Our second try was better: on a beautiful summer night, Bart and I went to see an outdoor performance of A Servant of Two Masters (free!) that was hilariously funny. We took a blanket and ate snow cones during intermission. Finally, the best of them all, an unbelievably good performance of You’re a Good Man, Charlie Brown (one of my favorite musicals ever) in the tiniest theater known to man. The entire theater was about the size of our living room. We went with Ralphie and B and ate Tejis in the park beforehand. 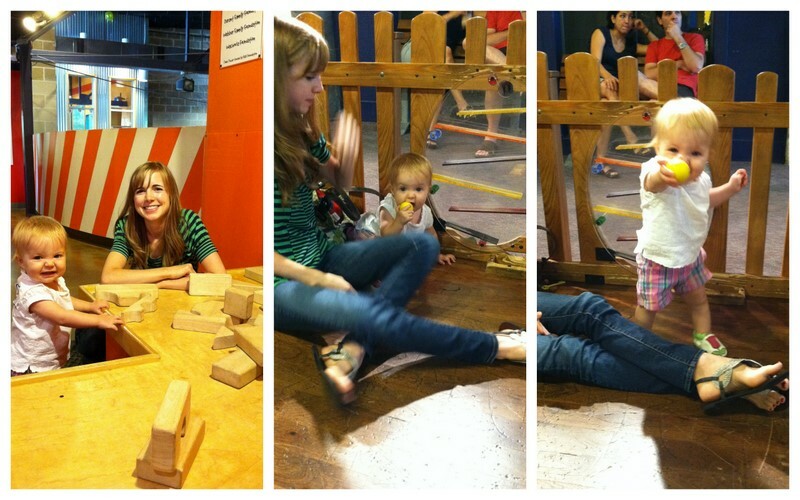 3) The Austin Children’s Museum. Bart’s office did a family day which was a huge success. I thought Ella would be completely uninterested, but she wouldn’t stop lunging for the baby section. She probably would have stayed for hours. Also, the lunch was really delicious. We got coupons to go back again and we will definitely not let those go to waste. 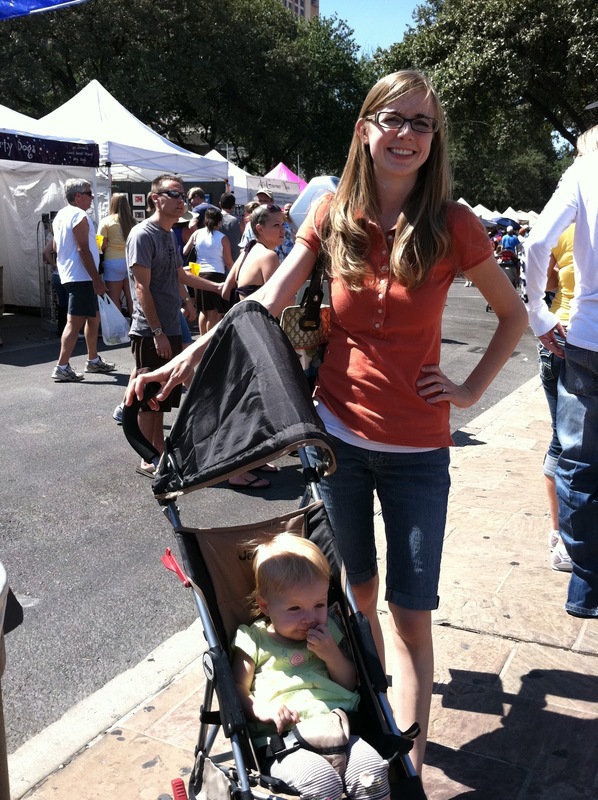 4) The Pecan Street Festival. It was SO hot, but we tried to stay in the shade and snagged several free samples of sorbet. Plus we got a really great parking spot for $1.50. So, definitely a win. Ella went nuts over all the dogs that were there (seriously, hundreds), and I wore the same shirt I did to the Texas History Museum. Apparently anything Texas-y makes me feel like I need to wear burnt orange. I swear I own other clothing. 5) The Austin Zoo. 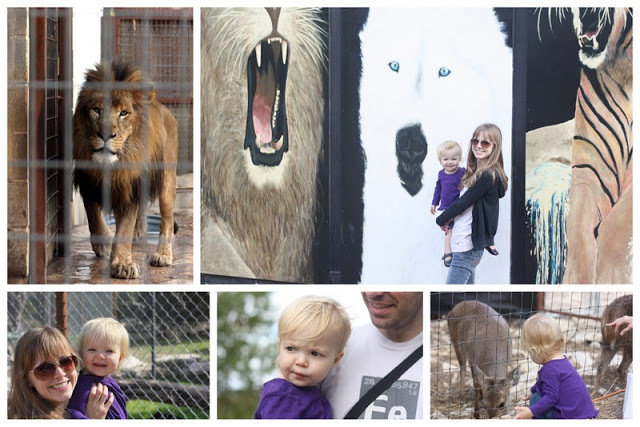 Last weekend, while Bart was off of work for the holiday, we went to the zoo. 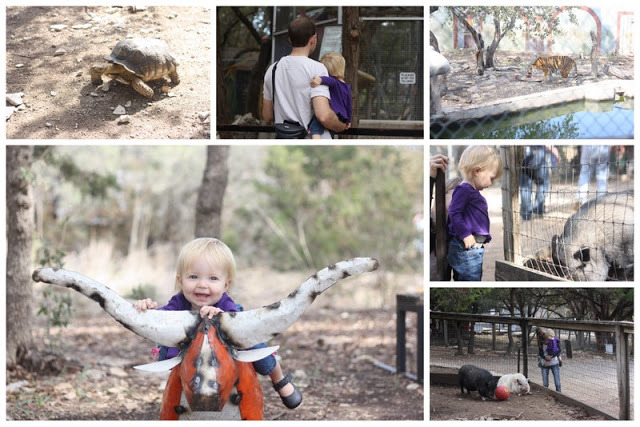 Ella was, not surprisingly, a big fan of the animals (surprisingly, the potbellied pigs were her very favorite). It’s a small zoo and I think the regular admission price might have seemed steep to me, but for $5 for all three of us, it was great. Also, our admission included bags of food for the petting zoo, but since everyone had the food, the animals were completely uninterested in it. Ella tried really hard to feed some deer and a goat and they wanted nothing to do with her. Have I mentioned before how much I love Austin? I can’t wait for a whole new line-up of adventures in 2012. So fun! Also, am jealous of your weather. DC has lots and lots of (freeee) things to do, too. I'm just sayin'. One time I was out with Eric and Andrew and Gordon, and I almost held Andrew's hand. It was weird. But also funny. I've heard such good things about Austin, and your post just solidifies it. I hope to visit someday!